I’m over the moon excited that Mandy has asked me to guest post on the topic of stress today because I believe it is the single most important factor in health and healing. Stress is an experience that is unique to each and every one of us. What is distressful for one individual can be positively stimulating for another person. Everyone knows about and has had some experience with the negative aspect of stress, but did you know that there are actually TWO types of stress? 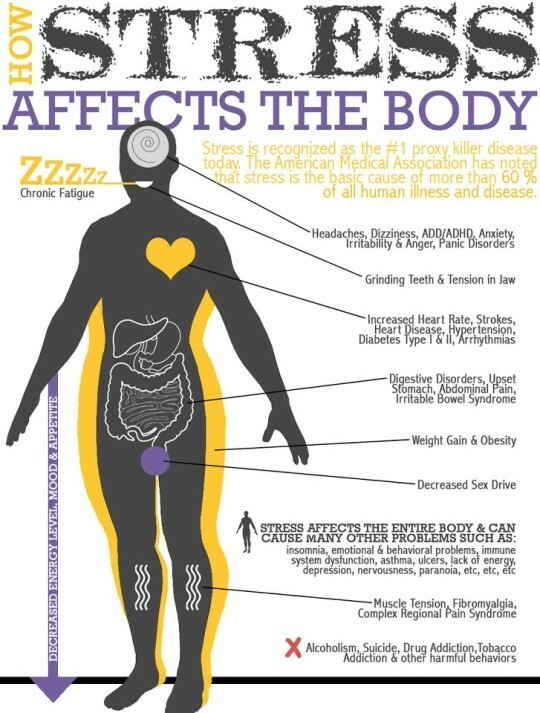 Stress is recognized as one of the main contributors to human illness and disease, which is not surprising because as you can see, stress affects virtually every system in the body. Take time to recharge your batteries by making sure to schedule rest and relaxation into your daily schedule. Don’t allow other obligations to encroach. Just like brushing your teeth twice a day, you should actively relax every day, and not just when you are feeling or expect to be stressed. Know your limits and stick to them. Whether it is in your personal or professional life, refuse to take on added responsibilities if it is more than you can handle. When you’re stretched too thin, you are likely to feel pressured, harassed, and rushed and the things you once enjoyed begin to become yet another item on your “To Do” list. Research suggests that regular, moderate exercise for 30 minutes a day, 3 days a week not only helps you stay fit, but also helps make you better equipped to handle the demands and pressures of life. Begin every day with a nutritious breakfast, and eat regular and nutritionally balanced meals throughout the day to ensure you are giving your body the fuel it needs to cope with the added stress. Especially in times of stress, avoid caffeine, sugar and alcohol as they strip the body of essential nutrients, which further promotes stress. What are your major sources of stress? And how to you handle them?